For North Carolina, immigrants are an integral part of the economy. This is something that should be remembered as new presidential candidates express their views on immigration reform. In an article in by Patrick McHugh for the North Carolina Justice Center, not only do immigrants contribute to the population growth that has taken place over the last two decades, but those areas that have large immigrant populations will have lower unemployment rates and lower levels of poverty on average. In areas of North Carolina where the immigrant population is less than 3%, there is a 7.8 unemployment rate, a 22.7% poverty rate, and the weekly wages are averaged at $603. However, let’s compare those averages to an area that has 6% or higher immigrant population: the unemployment rate is 5.8%, the poverty rate is 18.6%, and the weekly wages are averaged at $723. Another benefit that gets widely overlooked is that many immigrants in the U.S. put their entrepreneurial skills to work. The majority of the “backbone” businesses in cities like Charlotte are predominantly immigrant-owned. This includes retail, restaurants, neighborhood services and accommodation-based. 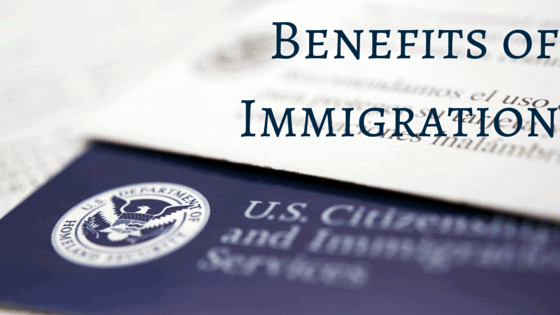 Immigrants are already a very beneficial part of the economy for many areas of North Carolina. This is what the melting pot idea from our Forefathers was supposed to do: bring in people from other countries and allow them to bring their ideas to our nation. According to the Migration Policy Institute in 2013 there were 749,426 (7.6%) foreign-born residents living in North Carolina. This is compared to 2000, where the number was 430,000 (5.3%). North Carolina has been experiencing a lot of growth, and immigrants are one of the main proponents in that change. Productivity goes up and prices go down on many of the products that people enjoy on a regular basis. Without immigrants, there would be a noticeable shift in the prices that we have grown accustomed to. We also wouldn’t have as many jobs because many businesses are created by immigrants which then give jobs to American-born citizens. It’s because of immigrants that the U.S. was able to create their railroad systems and later their roads. In more recent times, they have had their hand in the Information Age, fueling new discoveries.